Media editors will ALWAYS gravitate to the story with images and that is out of the ordinary…. 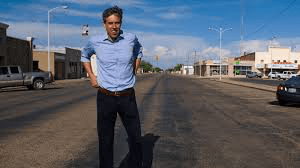 Democratic Texas losing Beto O’Rourke seems to have fit the bill on the above…. He has rocked into the top tier of 2020 Democratic hopeful’s…. Now we have the guy driving around the country alone and generating media attention? “Beto is able to drive his own message,” said Robby Mook, Hillary Clinton’s 2016 campaign manager. In a political environment where “the person is the message,” Mook said, “what makes him snacky for [the media] inevitably makes him refreshing and different for voters … The press writes about what Beto decides to do on his own, not in the context of Trump. That’s a big deal.”….